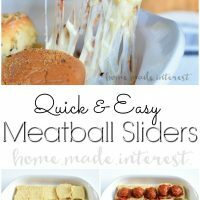 Easy Meatball Sliders - Home. Made. Interest. 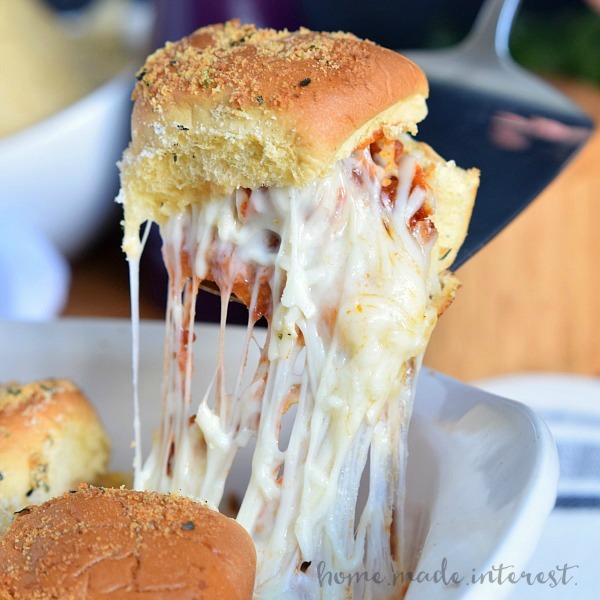 These cheesy Easy Meatball Sliders are an easy game day appetizer recipe that the whole family will love! 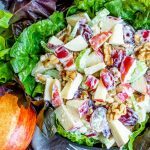 With the Big Game coming up, this week is all about what to feed your friends and family on game day. We always have a ton of people over for a party on game day, there is nothing better than cheering on your team with good friends, and of course food! 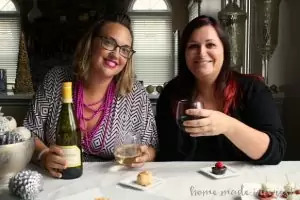 Since we have so many people to feed I try to put a few dishes on the menu that use a common ingredient so I can buy it in bulk and save a little money. Tomato sauce is one of the most versatile ingredients I can think of and I have so many awesome recipes I love to make with it. 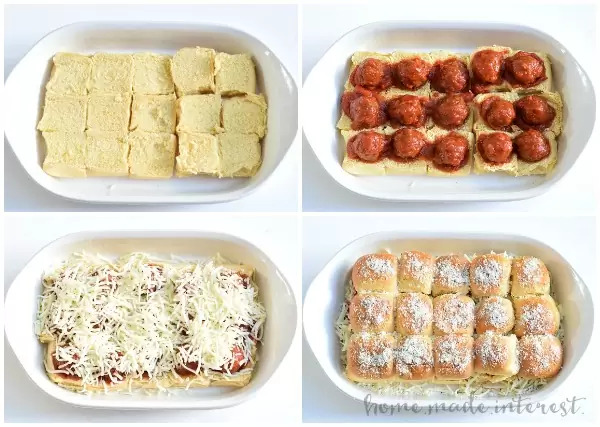 For game day you can’t go wrong with Easy Meatball Sliders, French Bread Pizza Sticks, and some Pizza Wontons (the kids love those!). I stock up on Ragu® sauce at Sam’s Club. 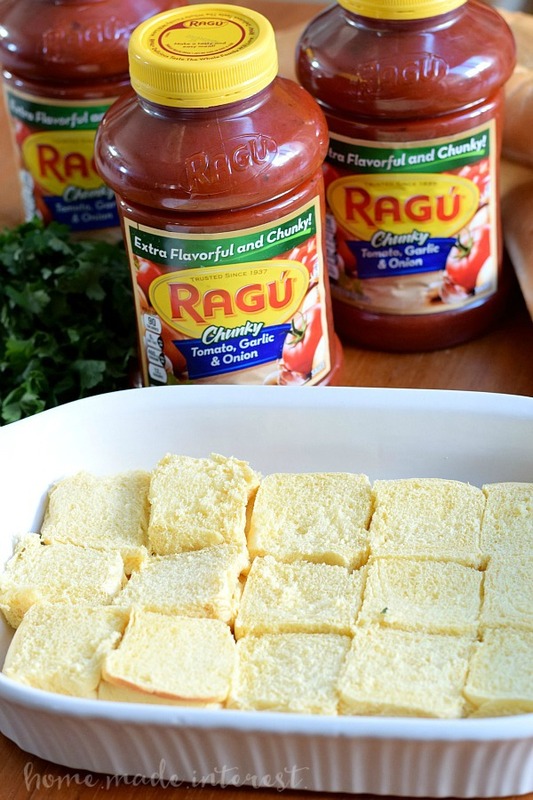 I trust the long-standing traditional, quality ingredients that Ragu® uses, and they have a 3 pack of 45 oz. Ragu® Traditional Sauce jars which means I can make all of my favorite recipes and still have some left over for dinner during the week. Let’s start with the main event, my meatball sliders are a favorite at parties and they are perfect for game day. 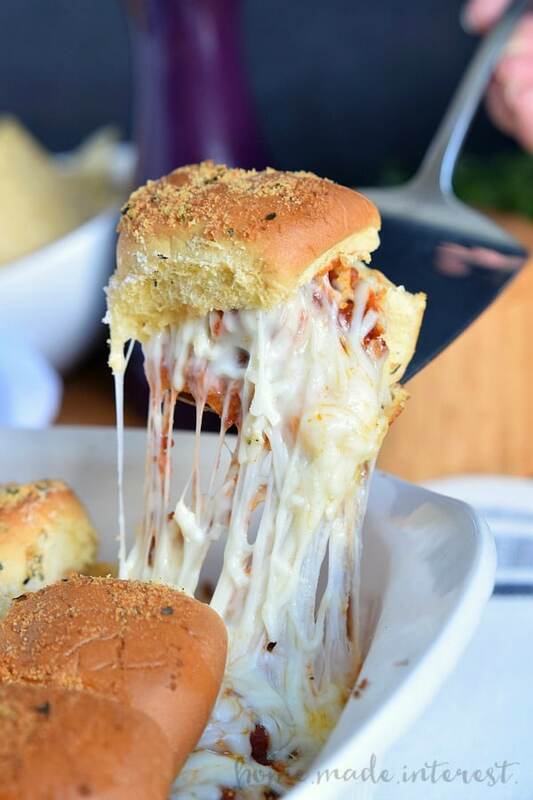 One look at those cheesy bites of delicious, saucy, meatballs, and you just want to dig in! They are super easy to make too. Just put the bottoms of your slider rolls in a casserole dish and cover them with Ragu® sauce. Next add your cooked meatballs (and a little more sauce because you can never have enough!). Then top them with lots of mozzarella cheese. Place the top slider buns over the meatballs and brush them with olive oil and sprinkle them with mixture of Italian seasoning and Parmesan cheese. Cover the dish with aluminum foil and bake for 10 minutes covered, then remove the foil and continue baking for another 10 minutes. You end up with mini meatball subs oozing with stringy mozzarella cheese. 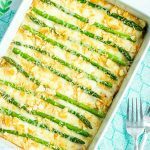 These are one of my all time favorite party foods and I usually have to make a double batch because I can’t eat just one! 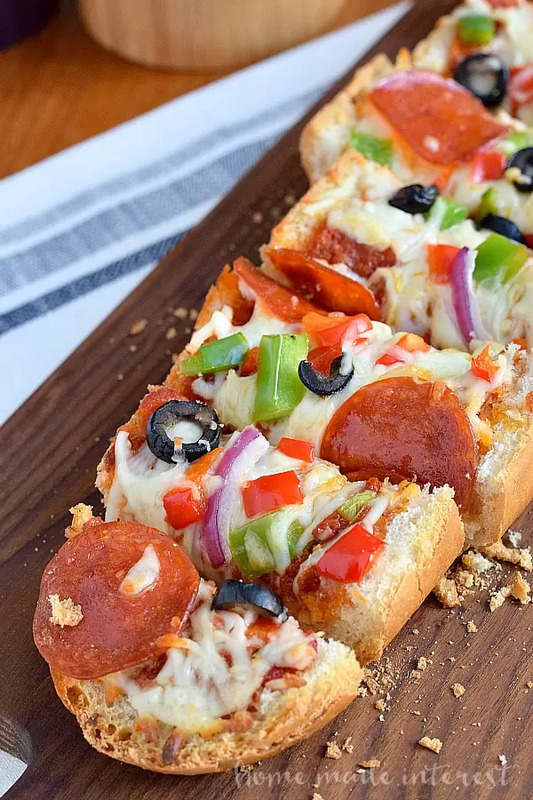 What goes better with subs than pizza, am I right? With the Ragu® sauce I can whip up some of the simple French Bread Pizza Sticks I showed you yesterday. 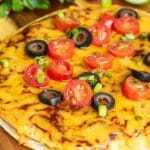 The great thing about pizza is that everyone loves it, young or old, and you can customize it to fit all different tastes. That’s important now that game days involve kids and adults! Speaking of kids they always request that I make these Pizza Wontons when we’re having people over. 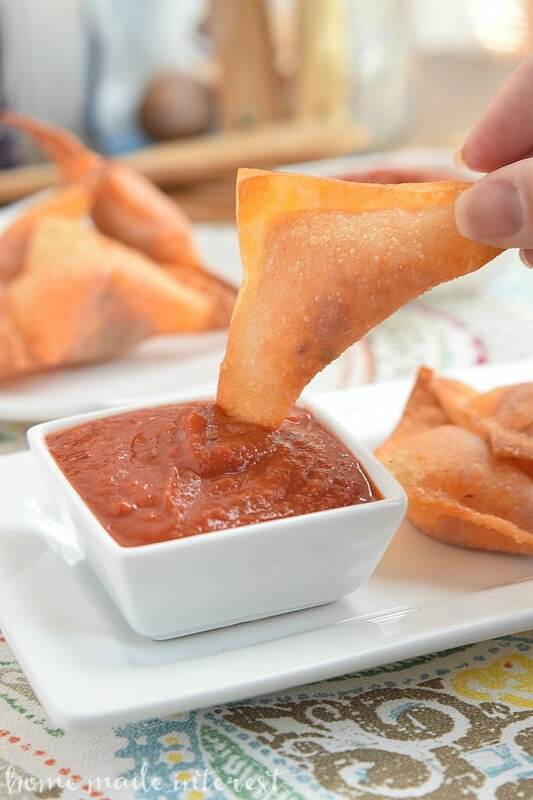 They are really easy to make and there is nothing better than crunching into a wonton filled with gooey cheese, pepperoni, and sauce. Yum! I hope you enjoy it and good luck to your team on game day!! So these were insanely good, except the bottom bun got disgustingly soggy. I had to remove the bottom buns completely. Any tips to avoid soggy bread? Luckily we didn’t have that problem but I wonder if putting the cheese down first, then sauce, then meatballs would fix the problem? You could also try doing meatball, putting sauce on meatball then adding cheese. If you try it again let me know if that helps! Read the comments before I made them, and put the cheese on the bottom before making them. It definitely helped with sogginess! Sooooo good! Will make again. I would love to make these for our church fellowship meal. Do you think they would be to soggy if they sat in a warm pan for about 2 hours? I think they will be fine. I suggest putting some sauce over the meatballs rather than under to keep the bottom buns from getting soggy. Just spoon some sauce over each meatball. Can you use frozen meatballs with this? Yes, but I would cooked them before hand. Be used for this? Thanks! I would like to make the meatballs sliders. I have a package of frozen cooked meatballs. I assume I should defrost the meatballs completely before making the recipe. Please update the recipe. I have all of the ingredients! 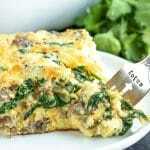 The recipe calls for cooked meatballs so you will need to cook your frozen meatballs before making this dish. The frozen meatballs are pre cook. They don’t need cooking again correct? A friend made these for our Pokeno group. She heated frozen pre-cooked Swedish meatballs on a sheet tray in the oven, which helped eliminate excess moisture and grease. Once heated through, she added them to Marinara sauce and minimized amount of sauce on slider to avoid soggy bottom. They were delicious! 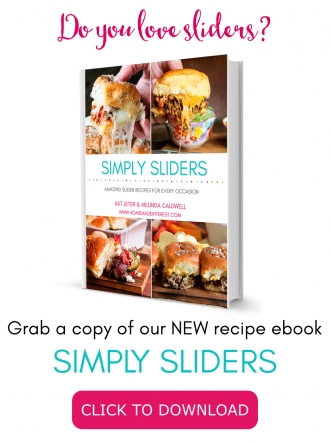 Love all your slider recipes….always looking for new tasty sliders! What brand of rolls do you use typically? Do you use Hawaiian rolls? Absolutely loved these! So easy and delicious! Thank you! These are great. Kids loved them. Only put sauce on top shelf nice people kept saying they were soggy. Really good idea though. I’m so glad you and the kids liked them! Made this for a football party and everyone LOVED them! So flavorful and easy. Didn’t change anything about the recipe. Will be making again for sure! Loved these! After seeing the soggy bottom comments, I decided to toast the bottoms for about 3 minutes while the oven was warming up. The toasted bottoms really helped to give the slider a solid bottom. I make this all the time when it’s my turn to cook. It’s my fiancé’s favorite and he begs me to get the stuff every time we go to the store. Yay! We love hearing that. Made meatballs sliders for work. They were a big hit .Thank you for sharing this recipe !